Around 1990 the Women’s Rock Music Co-operative started organising singing workshops in Salisbury under the banner “Free the Voice”. By 1992 this had led to a class run by Salisbury College called “Singing for Non-Singers” which in turn led to a group of singers forming a choir called “Untrained Voices”. From all of this emerged what is now the Salisbury Community Choir which celebrated its 21st birthday in 2013. For the first few years the Salisbury Community Choir was about 40 strong and was led by Jan Hughes. Then late in 1998 Jan resigned and Fiona Clarke was appointed as Musical Director with Ann Dean as Chairman, Margaret Fleming as Secretary and Ron Collins as Treasurer. Ann Dean still sings in the choir now and Fiona runs the Salisbury based Babes & Ballads. In many ways this was a crucial moment for the SCC. Fiona brought a new energy to the rehearsals and concerts, along with a dose of her unique sense of humour. Things moved up a notch musically and the choir became more competent and more ambitious. Regular concerts were held in local churches, at Stourhead Gardens, a lunchtime concert in St Paul’s Cathedral and even a concert in the cattle ring at the livestock market! In 2001 the choir launched into its first overseas tour with a visit to Germany, and tours to Paris and Poland followed, along with a surge in membership. In 2004 the choir took on its biggest challenge yet, when it decided to perform Karl Jenkins’ “Armed Man: A Mass for Peace” in Salisbury Cathedral. This was a massive undertaking as previously the longest piece of music the choir had tackled was the ‘Hallelujah Chorus’ from Handel’s “Messiah”. After months of intense work the concert was an amazing success. There was a full house and an opening speech by Rev Colin Jones, the then Dean of Cape Town Cathedral, whom Desmond Tutu had asked to represent him. Taking the title of the Karl Jenkins piece as his key, Colin Jones reflected on how most of the major nations spent vast sums on military academies but nothing on an academy devoted to the search for peace. Before departing he suggested that the choir should travel to Cape Town and perform the work there as part of Desmond Tutu’s efforts to raise the funds to build a Peace Centre in Cape Town and to celebrate the end of apartheid and the formation of the new South Africa. Much planning followed and in 2007 about 110 of the choir set out on what was to be a massive adventure. 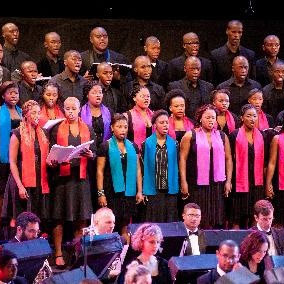 There were concerts in Cape Town’s St George’s Cathedral, at the Waterfront, at Elsie’s River (a coloured township) and in Gugulethu (a large black township near the airport), plus a massive concert in Cape Town’s City Hall where the SCC, plus three local choirs, performed the African Premiere of “The Armed Man”. Later a smaller group drawn from these choirs performed the same work in Carnegie Hall, New York. It was always hoped that during the trip the choir would get to see parts of South Africa that the tourist normally never visit. A preliminary contact had been made with the Fezeka High School in Gugulethu, and despite some reservations, one morning the whole party set out in coaches for the township. So started a day that was to have massive implications for the future of the choir. The young people showed the choir members around the school and the township and then everyone gathered at a church for an evening joint concert. They sang, we sang and we sang together. The audience cheered, clapped and shouted and we all became struck by the wonderful voices of the black students, only to hear that there was no prospect of them ever developing their voices because they could never afford to go to the University of Cape Town Opera School. That evening the Fezeka Scholarship Fund was born. This is now an independent Salisbury based charity that raises money to help fund the costs associated with disadvantaged South African students studying at university or on vocational courses. So far the charity has raised over £120,000 and supported about 25 students. The combined efforts of the Salisbury Festival, the Donald Gordon Foundation, Wales Millennium Centre, a private donor and the SCC resulted in a 77 strong party from the Fezeka High School visiting Salisbury in 2008. They stayed with SCC members and together performed in Salisbury Cathedral and in the Wales Millennium Centre. In 2009 Fiona resigned as Musical Director and the choir appointed Jeremy Backhouse, a choral director of national standing who had just moved to Salisbury. Jeremy is Musical Director of the Vivace Chorus who perform regularly in Guildford Cathedral and on a less regular basis in the Royal Albert Hall. He also runs the Vasari Singers who are one of the top UK chamber choirs and have an international reputation. Under Jeremy the SCC was a major part of the Salisbury Chilcott Project, which commissioned Bob Chilcott to write the “Salisbury Vespers”. This work was then performed with other local choirs in Salisbury Cathedral. 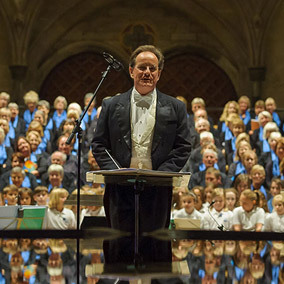 Two performances within the Salisbury Festival and two European tours to Spain and France have followed along with a CD, but the highpoint of 2013 was a concert which marked the choir’s 21st birthday – a celebration of community music and a demonstration of what can be achieved with hard work and determination. The first half of the concert was the first performance of “The City Garden”, a new composition commissioned by the choir from Will Todd. “The City Garden” is a magical story of ecological renewal and awakening. Will Todd also composed “The Call of Wisdom” that featured in the Queen’s Diamond Jubilee Thanksgiving and “Mass in Blue” among many other works. This was followed by Benjamin Britten’s “Saint Nicolas” in the second half. The choir now plans to perform this commission in other cathedral cities, inviting other local choirs to take part. In May 2014 the choir will be singing this piece in Lincoln cathedral.